Thu, Sep 6, 2018, 11:48 pm SL Time, ColomboPage News Desk, Sri Lanka. 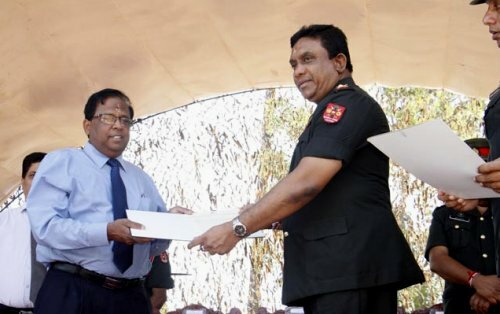 Sept 06, Colombo: Sri Lanka Army has released another 4.4 acres of land in the Valikamam North Divisional Secretariat area in Jaffna, used by the Army for service requirements during a brief ceremony at Myliddy Town on Thursday. The Army has symbolically released a land patch of 2.75 acres, belonging to the Kalaimagal Vidyalayam, Myliddy North, a stretch of 1.19 acres, belonging to several families in Sandilipay area and another land block of 0.5 acres, owned by Kurumbachetti Co-operative Shop and the Community Hall to the Zonal Education Director and the District Secretary for Jaffna, Mr N Vethanayahan, enabling both of them to go ahead with onward arrangements for issue of their legitimate deeds, certificates, etc through the District Secretariat. Major General Darshana Hettiarachchi, Commander, Security Forces - Jaffna (SF-J) on behalf of the Army gave away those formal documents during the brief ceremony. Extending another gesture of goodwill of Jaffna troops, the Jaffna Commander pledged assistance to completely renovate the Kalaimagal School and on the same occasion distributed gift parcels of books to more than 200 students of the school. On behalf of the District Secretary, the Divisional Secretary for Thelippalai addressed the gathering and thanked the Army for its timely gesture.